Braddock Bay Bird Observatory collaborates with researchers and their students – both graduate and undergraduate – from a variety of academic institutions. If you would like to conduct research at BBBO, contact us by email. 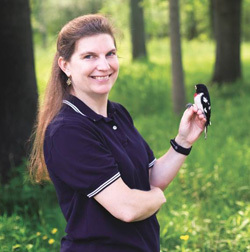 Dr. Covino earned her PhD from the University of Southern Mississippi under the direction of Dr. Frank Moore where she studied the overlap between the breeding and migratory life-history stages in Nearctic-Neotropical songbirds. She is particularly interested in the processes that determine how and when individuals complete life-cycle events. 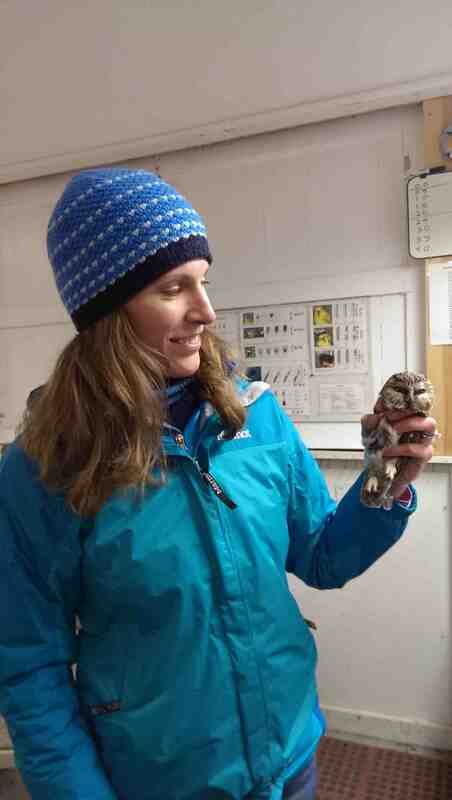 Currently, she holds a postdoc position at Canisius College, teaches courses at the Shoals Marine Lab, and collaborates with researchers at BBBO and elsewhere on a variety of migration-based projects. Dr. Cunningham and his undergraduate students study the olfactory sensitivities in a variety of birds. At BBBO, the Cunningham lab investigates whether passerines are sensitive to a variety of scents. The lab is also studying how the length of telomeres, the ends of chromosomes that protect DNA, varies across species and life history traits such as body size, age of first reproduction, and length of life. Mark received his Ph.D. in Zoology in 1998 from Indiana University, where he specialized in Animal Behavior and minored in Neuroscience. He is currently a Professor in the Department of Biology at Hobart & William Smith Colleges in nearby Geneva, NY. Mark is currently First Vice President for Wilson Ornithological Society, the second oldest and second largest scientific ornithological society in North America, and he is an Associate Editor for The Auk: Ornithological Advances. He is also a past president and current board member for BBBO, chairing the Observatory’s research committee. He has held a sub-permit for banding since 2002. Mark’s research over the past 20 years focused on sensory aspects of migration and navigation, particularly the use of the earth’s magnetic field and visual cues in animal orientation. He has conducted experiments on a wide variety of organisms including salamanders, trout, hamsters, and, of course, birds. Mark’s research interest in birds and migration began while he was an undergraduate student with Dr. Robert Beason at S.U.N.Y. Geneseo, where Mark and Bob studied the magnetic sense of Bobolinks. He has also studied magnetic navigation in Australian Silvereyes, as a Visiting Scholar at the University of Technology in Sydney. At the Observatory, Mark’s orientation studies focus on sparrows, thrushes, and warblers, and he has recently expanded his research program to understand the physiological, or energetic challenges, of migration in songbirds. Dr. Morris and her students use the Mobile Avian Revording Studio (MARS trailer) to investigate the night flight calls of passerines. Away from Braddock Bay, Dr. Morris coordinates the Environmental Science major and the Environmental Biology minor at Canisius College, manages the Appledore Island Migration Station, and is active in several ornithological organizations. Sue received her sub-permit in spring of 2000 and her master permit in the spring of 2015. As a graduate student working with Dr. Chris Norment at SUNY Brockport, she conducted research at the Kaiser-Manitou Beach research station for her Master’s thesis on migratory restlessness of fat vs. lean Swainson’s Thrushes and White-throated Sparrows. Sue received her Ph.D. in Environmental Sciences at the University of Rhode Island in 2007. Her dissertation research focused on the nutritional ecology of migrating songbirds on Block Island, in particular the importance of seasonal frugivory for stopover refueling performance. Sue was a postdoctoral fellow at Villanova University from 2008-2010 and initiated a new research project at BBBO in the fall of 2008 as part of her postdoctoral research. This project utilizes plasma indicators of fattening rates and diet to study the migration physiology and stopover site use of thrushes, sparrows, and other small songbirds. Sue is currently an Assistant Professor in the Department of Biological Sciences at the Rochester Institute of Technology. Sue and her students at RIT are currently working on several projects including measuring the nutritional quality of native and invasive fruits that are consumed by migrating birds at BBBO, linking annual differences in fruit quality with migration stopover physiology, and assessing seasoning changes in chronic stress and body condition of songbirds across spring, summer, and fall seasons at BBBO.